You're playing in a multiple deck game and are dealt a pair of Aces. The dealer also has an Ace. The rules say that there is doubling down after splits allowed. What is the move you employ? Do you go ahead and split the aces, or proceed with a total of "soft 12"? The correct play, of course, is to split the aces. Remember one thing about splitting here. When you normally split hands up, you can take any number of cards you like to either of the split cards, as you deem appropriate. But when you draw to split aces, you can only take one card. That having been said, it is still much better to split aces than it is to play this hand as a twelve. In fact, there is a tremendous disparity in results here. Simply expressed, you will win more than you lose when you split, and lose more than you win when you don't. I mean, obviously, when you can start at 11 with two hands you're a lot better off than having one hand of 12. 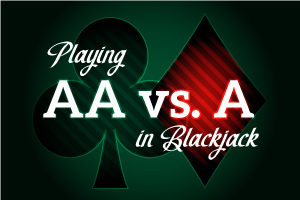 When you split the aces, you're going to win 49% and lose less than 43%. If you play the hand as 12 (i.e., if you don't split), what happens? Well, you're going to win just 43% of your hands, and lose a little more than 45% (11.6% of the time, you'll push). That's not tragic, but it's not good either. You need to split!